Seven-year-old Chellamuthu is kidnapped from his village in India, sold to a Christian orphanage, and then adopted by an unsuspecting couple in the United States. It takes months before the boy can speak enough English to tell his parents that he already has a family back in India. Horrified, they try their best to track down his Indian family, but all avenues lead to dead ends. Meanwhile, they simply love him, change his name to Taj, enroll him in school, make him part of their family—and his story might have ended there had it not been for the pestering questions in his head: Who am I? Why was I taken? How do I get home? More than a decade later, Taj meets Priya, a girl from southern India with surprising ties to his past. Is she the key to unveil the secrets of his childhood or is it too late? And if he does make it back to India, how will he find his family with so few clues? From the best-selling author of The Rent Collector, this is a deeply moving and gripping journey of discovering one’s self and the unbreakable family bonds that connect us forever. Find a helpful reading guide in the back of every book, as well as additional content on this website specifically tailored for book groups and avid readers! Also, for a limited time, sign up to Skype with the Author! Give us your email (only to keep you informed of upcoming events) and you will get access to special bonus material, including the original recordings from when Taj first shared his amazing story! Order your copy of The Orphan Keeper today by clicking here! "An enlightening book that gently reminds us we are all searching for home." "... a meditation on identity and the meaning of family, and a novel that is sure to be a book-club favorite!" 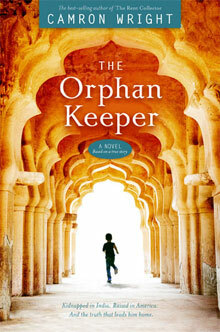 "The Orphan Keeper is truly a remarkable story of one young man's journey to discover his past." "Not only a heart-wrenching story, but a heartwarming story as well." "[The] words are a vehicle of hope, the message an uplifting one"
a new novel from the author of The Rent Collector.